I have just discovered the most amazing app. Usually I am not one to use an app for everything. In fact, I have like 4 apps on my phone, well 5 now that I added the awesome House Monkey app. The name might be a bit silly, but the concept is anything but. It is a household managing app. "What is a household managing app?" you ask. Well, it is a comprehensive organization super tool. I am the world's worst organizer. I mean it. I am constantly on my last thread of sanity. I can't remember my own name half the time. With House Monkey, I am finally taking control of managing our household. 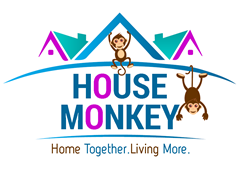 House Monkey is like a the digital version of a chore chart, to-do-list, event manager and file cabinet all in one. A schedule of household chores, errands, activities and events can be loaded into the app so that everyone in the family can be on the same page at all times. It is such a time saver. Everything runs so much more efficiently, and all the weight is no longer on my shoulders alone. Now my husband can keep track of school events, dinners with the in-laws, trips to the grocery story, and when it's his turn to take out the trash or sweep the porch. It help me remember what chores that my kids and husband are going to do, so I don't end up doing them myself. It also has reminders for home/appliance maintenance like changing the air conditioner filter, cleaning the dishwasher or adding septic tank additive. I can even set rewards and issue "Banana Points" for chores completed. As if everything running smoothly is not reward enough. It helps all of us plan our schedule, so we never double book. We all have calendar apps, but they are all independent, so we never used to know when someone else in the family already had a commitment. Now we all manage our commitments in the House Monkey app, so we all know when one family member is busy. It makes everything so much easier and avoids having to cancel plans later. As nice as the household management is, I am just as thrilled to have the scanning capacities. I would use a whole different app for that if I needed to, that's how badly I needed this in my life. With House Monkey you can scan recipients, warranties, contracts and other vital paperwork. You can also store data-heavy videos and photos. I had so many product warranties and especially user manuals all over the house. I am the type that keeps them for months or years, and ends up getting so fed up with the clutter and throwing them away - right before I need them. It's the same with receipts. I also scan in the grocery lists, so hubby knows exactly what to get without having to remember it or try to use a paper list (that he would lose.) In fact, I lose every list that I make also. It has been a huge help to me. Also, I almost was not able to download the House Money app because my phone has so many photos and videos that I was out of space. I had to delete some. I have since uploaded them all to the House Money app, so now I have tons of space again. Really, House Monkey is taking care of everything. I am still the world's worst organizer, but my life is so much more efficient now. house Monkey does all the work, and my family gets all the convenience and none of the stress. I am so glad that I found an app that could help me manage our lives in spite of my absentmindedness and lack of any planning skills. House Monkey is awesome.